Annie Anton discusses privacy and applications at the FutureWeb conference, part of WWW2010 in Raleigh. Marc Rotenberg, of the Electronic Privacy Information Center (EPIC), led an interactive session this afternoon on the future of privacy and the Web. Panelists included Dave Hoffman of Intel, Anne Klinefelter of the UNC School of Law, Jolynn Dellinger of Data Privacy Day, Annie Anton of NC State and Woodrow Hartzog of UNC’s School of Mass Communication. 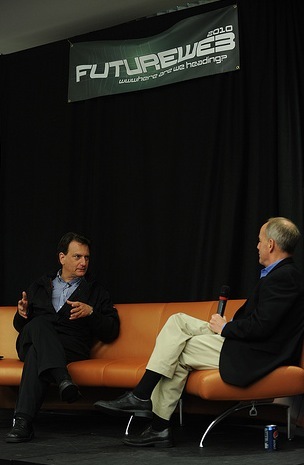 Rotenberg, of the Electronic Privacy Information Center (EPIC), led a lively and interactive session at FutureWeb on the future of privacy and the Web that touched on many aspects but mostly focused on social media and cloud computing. Klinefelter addressed some policy issues from an educational standpoint. She said that readers’ privacy has long been a concern of librarians, but it is a problem that has been amplified online. Since books have gone digital with the invention of E-readers and tablets, people’s uses of content can be tracked and the information is not solely personal anymore. Klinefelter said Internet users should band together to protest, in order to achieve privacy settings on all personal online content. Without the implementation of fair and open policies, the consequences can include identity theft, access to financial records and the compromising of health records. Marc Rotenberg, director of the Electronic Privacy Information Center, leads expert panelists through a lively discussion of privacy issues. The panelists discussed how social media can expose many layers of information people once kept private. Rotenberg asked audience members if they think employers have the right to look at political candidates’ Facebook pages. The majority of people raised their hands said they did not agree. One audience member noted that a lot of the information on Facebook, such as that about religion, political opinion and sexuality, would not be legal to ask about during a formal job interview. Antón addressed further challenges of online privacy rights, including expectations of privacy on social networks. “A lot of people have a reasonable expectation of privacy but don’t understand they have to participate in setting things up so they can have that expectation of privacy,” she said. There is a large percentage of the population that remains uninformed about privacy issues, though Anton doesn’t view it as a generational glitch. “Some people know, some people don’t – it’s as simple as that,” she said. How do we express privacy policies more effectively? Antón said society needs to address issues such as Australia’s censorship controversy and consider how to balance privacy rights with national security and free speech. Jolynn Dellinger of Data Privacy Day discusses a point about privacy education at the FutureWeb conference at WWW2010 in Raleigh. Dellinger, of Data Privacy Day, spoke about the challenges to informing the general public about privacy rights. Dellinger’s work related to Data Privacy Day tries to take education and put it into the hands of people to help with individual privacy practice. She said education is essential because it’s impossible to actively participate without an informed voice, adding that she hopes more tools on privacy education will be available in the future. Woodrow Hartzog, formerly a clerk with the Electronic Privacy Information Center, spoke about privacy as “an umbrella term,” encompassing two issues: obscurity and confidentiality. There is a certain value that lies in obscurity that is only going to increase, he said. 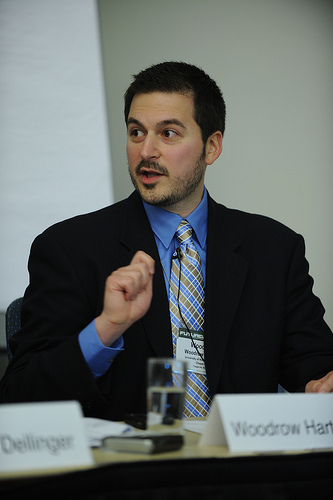 Woodrow Hartzog says privacy is an umbrella term for "obscurity and confidentiality." He compared the explosion of online content to the urbanization of cities, which allows people to become somewhat lost in the crowd. Hartzog noted that people can find ways to hide their blogs from search-engine results, and they can refrain from the real-time conversation, which is also more searchable today, with some content like that of Twitter being exposed even in a Google search. He said people should not be shy about requesting more confidentiality when they want it online. The transparency of companies in confidentiality agreements is crucial when thinking about the future of privacy, he said. David Hoffman of Intel concentrated his remarks on cloud computing and continued the discussion on privacy’s future by referencing the past. “I think cloud computing is somewhat like how we’ve been physically reaching the clouds (through commercial air travel) for the past 50 years,” he said. He noted that this aspect of human sharing – by storing information in remote databanks – “in the cloud” instead of on a local hard drive – is nothing new. But mass adoption of the cloud for storage of vast amounts of people’s most personal information is. Our culture has developed to the point where we have a substantial reliance upon technology, along with a need to trust this technology – we trust it to be available and functional, to possess a certain measure of security assurance and trust that privacy will be respected, he said. Hoffman said he is unsure of whether we are doing a satisfactory job of meeting these privacy expectations. “We’re heading to a global digital infrastructure,” he said. He described the key problems can that arise online include the fact that private information can be stolen or hacked and that the information stored in the cloud can be lost. Hoffman noted that policy should be changed to compensate for new interactive technologies that allow for increased violation of privacy. Klinefelter agreed that privacy laws need to have a second look. “I would like the legislation – to have more an opt-in than an opt-out,” form of online privacy she said. Antón said laws should changed to be compliant with software that can protect privacy, and Hartzog said he hopes to see revision in surveillance law. Marc Rotenberg, president of EPIC, will lead a session on The Future of Privacy and the Web at the FutureWeb conference in Raleigh, N.C. 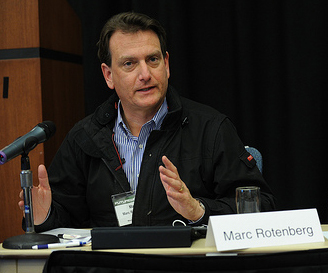 Chair: Marc Rotenberg, executive director of the Electronic Privacy Information Center. Session description: Privacy is evolving as people use the Web to share in new ways. Among the issues that can be considered are the economic and political advantages of respect for individual privacy; balancing security and privacy concerns; identity theft, identity fraud and information leaks; concerns tied to Web 2.0 and social networks; cloud computing and privacy (individuals’ control over personal data and data retention); regulation of illegal web content; regulatory models for privacy; network neutrality; frameworks for freedom; ethical dimensions in ensuring the openness of the Internet. The panel will aim to specifically isolate the key challenges and opportunities in the looming future for privacy and the Web and it will work to identify some specific action steps that can be taken today to work for a better tomorrow. 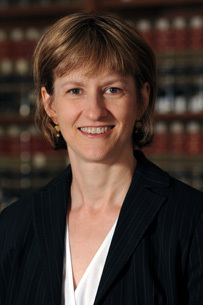 Anne Klinefelter, expert in privacy law and director of the law library at the UNC School of Law. She has conducted research in the areas of privacy law, the First Amendment, copyright law and licensing. Klinefelter serves on the Advisory Board of the UNC Center for Media Law and Policy. She is also chair of the American Association of Law Schools Section on Law Libraries. Click here to watch a brief interview with Klinefelter in which she discusses the importance of online resources and issues surrounding intellectual property. 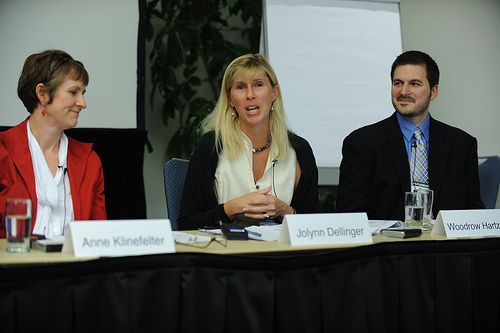 Jolynn Dellinger, program manager for Data Privacy Day at The Privacy Projects and former privacy and security counsel for Intel. More information about Data Privacy Day 2010 can be found at www.dataprivacyday.org. 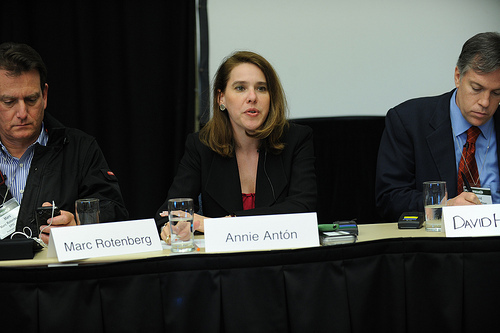 Annie I. Antón, professor of computer science at North Carolina State University’s College of Engineering and co-founder and director of ThePrivacyPlace.org. Antón works with the organization, which is made up of a group of students and faculty at NCSU, Georgia Tech and Purdue University, to develop technology to help ensure that privacy policies are aligned with software systems. She also serves as a board member of The Future of Privacy Forum. 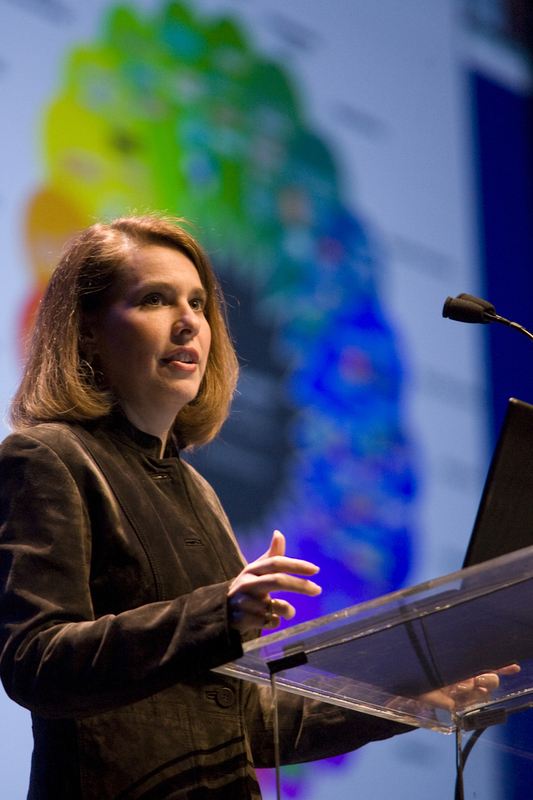 Antón has received a number of awards, including the 2000 NSF CAREER Award, 2002 Computing Research Association Digital Government Fellow Award, the 2003 NCSU College of Engineering Pride of the Wolfpack Award and the 2005 CSO (Chief Security Ofﬁcer) Magazine’s Woman of Inﬂuence in the Public Sector Award. 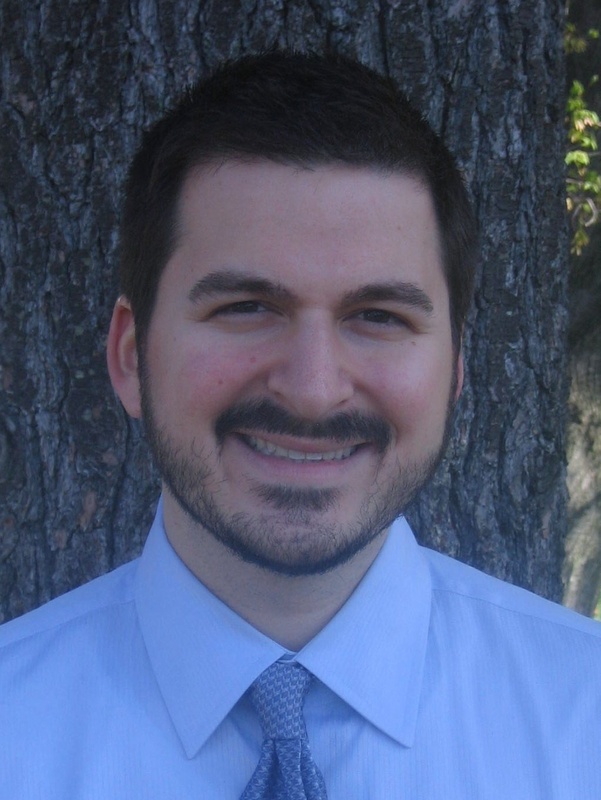 Woodrow Hartzog, Park Fellow at the University of North Carolina in Chapel Hill School of Mass Communication. His research interests include privacy, online communication and information law. Hartzog was formerly a clerk at EPIC. He tweets as hartzog at https://twitter.com/hartzog. Marc Rotenberg, executive director of EPIC, will lead a session on The Future of Privacy and the Web at the FutureWeb conference in Raleigh, N.C.
Rotenberg’s letter foreshadows the themes he will discuss as chair of The Future of Privacy and the Web session at the upcoming FutureWeb 2010 Conference in Raleigh, N.C.
To learn more about the future of Internet privacy, register for the FutureWeb conference. More details about the conference schedule and speakers can be found on the FutureWeb site.